Developed by Media Molecule. Published by SCEA. Released November 22 2013. Available on PS Vita only. Everyone loves a good story. Story is a driving force in all the media we consume and it can be pivotal to the success of many of the best games. Tearaway is one such game and while the story is integral to this title, the journey is possibly even more alluring than the destination. Set in a world made entirely of paper, Tearaway is a charming, innovative PlayStation Vita exclusive. The player controls atoi or iota, messengers crafted completely from the physical messages they're delivering. Thanks to the PS Vita's handheld interface, players are also integrated personally into Tearaway as the mysterious, omnipresent "You". As the You, the player literally holds the world of the messenger in their hands, and the implementation of tactile integration with the game's setting and characters is nearly seamless. Nearly. The player is enabled to help atoi or iota on their journeys by physically "reaching" into their world. Tearaway uses the functionality of the PlayStation Vita to its fullest, requiring both front and back touchscreen game mechanics as well as traditional button and thumbstick controls. The direct control enjoyed over Tearaway's colorful, paper world is one of the most innovative parts of this game. When navigating one's messenger through a level, often the player is required to tap on the rear touchscreen in order to help their chosen partner clear a platform or physically move barriers in the landscape. While this type of functionality is impressive and fresh, sometimes there is a disconnect between the function and its actual implementation in the game. Often, the player's finger doesn't appear in the game's specified area when the rear screen is touched and sometimes the messenger doesn't achieve the intended amount of bounce to help reach the next platform but these errors are such minor issues that they really only prompt the player to retry the action until it's perfected. If a repeat is necessary, achieving the desired goal never takes more than a few tries and this never felt repetitive or unnecessary. Tearaway also makes good use of the PS Vita's front and rear cameras. While the player navigates levels with atoi or iota, often their face is suspended in the air inside of a godlike yellow paper sun, the bridge that gaps the "You's" world and the world of their chosen messenger. 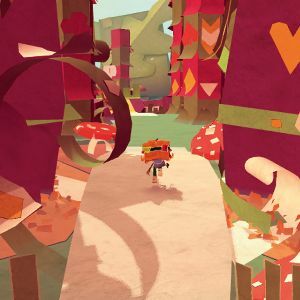 Frequently, the player is asked to capture images from their world in order to have them show up in the paper world of Tearaway as a skin or a detail, implemented instantly into the game's setting or characters. The use of the cameras makes an already engaging game feel even more so, and offers just one more way for the player to truly connect themselves with the game. Taking pictures isn't the only way the player is allowed to manipulate this bright, pliable world. Presented with a craft room of their very own, the player can create decorations out of construction paper in seven different colors for both plot development and character customization. The player also has options to mix and match pre-made decorations with ones they create themselves. This is most prominently featured for the messengers atoi and iota and once the customizations are confirmed, the player also has the ability to save variations of the avatars and can return to them or the original messenger's style at a later date. As the You, the player also gets several customization options including a choice of skin color for the hand that disturbs the vibrant paper world as well as a choice of hand size (small or large) to correlate to the player's own hand size and the option of which gender the player prefers to associate with. 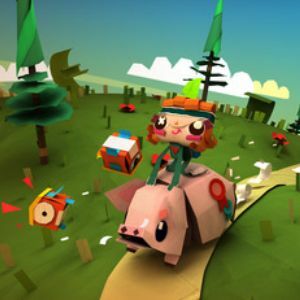 Tearaway even has a way keep the player hooked for even more real-life implementation with the addition of collectible papercrafts and the Tearaway.me feature. Capturing images of the surroundings and characters becomes second-nature and the player is offered a choice to upload their images and papercraft discoveries to Tearaway.me. A papercraft is found when images are captured in the game, thus allowing the player the opportunity to print out paper patterns of objects and characters found in Tearaway to further bring the world of paper into their own. The player can log into this site with their PlayStation Network account to find a personal profile housing each photo or pattern uploaded from their game experiences. These patterns and photos can also be shared to the player's friends via PSN. All of this is well and good but what it really boils down to is that Tearaway is just fun. Thoughtful, engaging, and charming in a way that many recent games haven't been, this beautiful world will appeal to lovers of platformers both old and new. And yes, it's a PlayStation Vita exclusive and sure, lots of people don't own a Vita, but the game itself has integrated the PlayStation Vita's functionality so well that housing it on any other platform seems wrong. Bottom Line: There are a few small issues with Tearaway, but this game is so enjoyable that you probably won't even notice them. Recommendation: If you have a Vita, this game is a given. If you were considering getting a Vita, this game could push you over that edge. If you're not getting a Vita, it's definitely worth trying to borrow one from someone.